By now you’ve discovered that automated marketing works wonders in spreading the word about your salon. You spend lots of time crafting the perfect message and selecting which list of clients should receive the email, but now it’s time to create targeted subject lines. While they may seem less important than the content inside the email, subject lines directly impact how many people view your message. You have a small amount of space to make a big impression on current or prospective customers, and should take advantage of making sure your message pops. There are several different styles of subject lines you can use when reaching out to your database. One simple way to pique interest in your target demographic is to pose a question in the subject line of your email. Some examples would be, “In Need of a New Back To School Look?”, “Ready for a Holiday Mani-Pedi?” Using questions allows the customer to interject their own needs on the message, meaning they become more likely to open the email. If the body of your email contains promotional offers or discounts, cut to the chase and advertise the deal in the subject line. Use catchy succinct wording like “Ready to Receive 20% Off Your Next Facial?”, “All Summer Blowouts $50 Off – One Day Only!” Try combining offers, such as $50 off, within a limited time frame, one day only, to create a sense of urgency in your customers. Another way to attract the interest of customers is by tailoring the emails to their needs as best you can. SalonTarget’s automated email features let you input codes that will auto-populate the recipient’s name into the subject line. What’s more, you can create custom lists within SalonTarget, meaning you have the utmost control over who gets what message. Use this to your advantage by making sure the recipient is interested in the subject matter. For example, if you know a recent customer often gets highlights and haircuts, put them on a list to receive promotional materials about hair services, specifically colorings. Ultimately, creating powerful subject lines and marketing materials comes down to knowing your target demographic. Who is your ideal customer? What do they like, dislike and what would they respond to most excitedly? 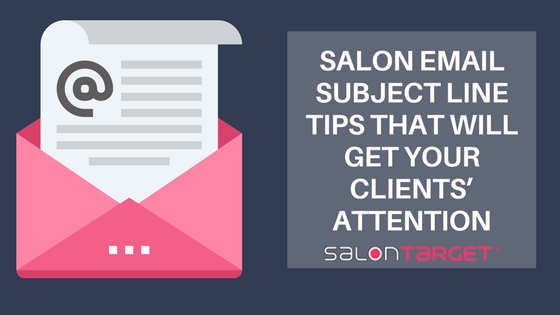 Once you’ve narrowed down this information, and incorporated our subject line tips from above, you’ll be using SalonTarget like a pro in no time.